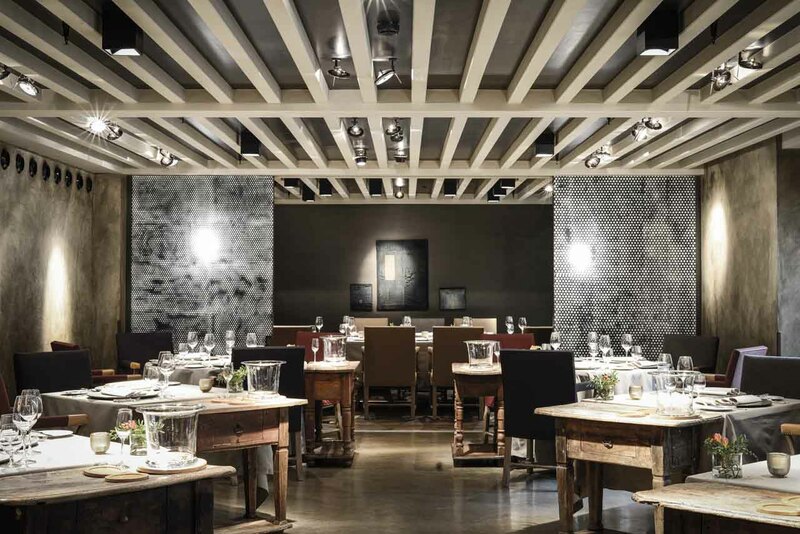 Atelier is the fine dining restaurant of Munich's luxury five-star Hotel Bayerischer Hof, recently making the news because of the high-profile 53rd Munich Security Conference that was held at the hotel. Executive chef of Atelier since 2014 is Jan Hartwig (b. 1982). Hartwig gained his first kitchen experience in the early 00's at restaurants in the vicinity of his birthplace Helmsted and also included a gig at the German dinnershow Pomp Duck and Circumstance. Things really took off in 2005 when he joined the kitchen team of two Michelin starred Restaurant Kastell in Wernberg-Köblitz, then under the reign of future three-star chef Christian Jürgens, and in 2006 he became chef de partie at three Michelin starred Gästehaus Erfort in Saarbrücken. 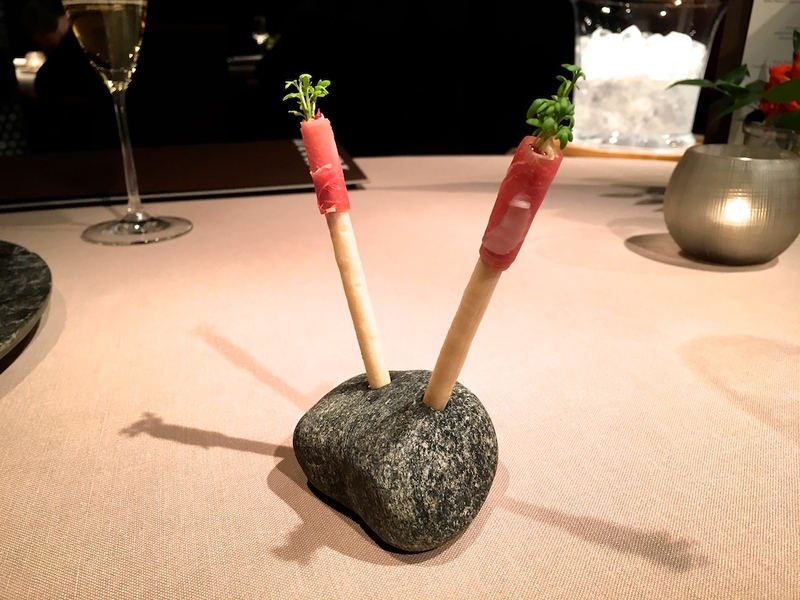 The next year he managed to secure a position (chef de partie) at Sven Elferfeld's three Michelin starred Aqua in Wolfsburg, moving up to the sous chef position within two years. He stayed at Aqua until his departure to Atelier in Munich in 2014. 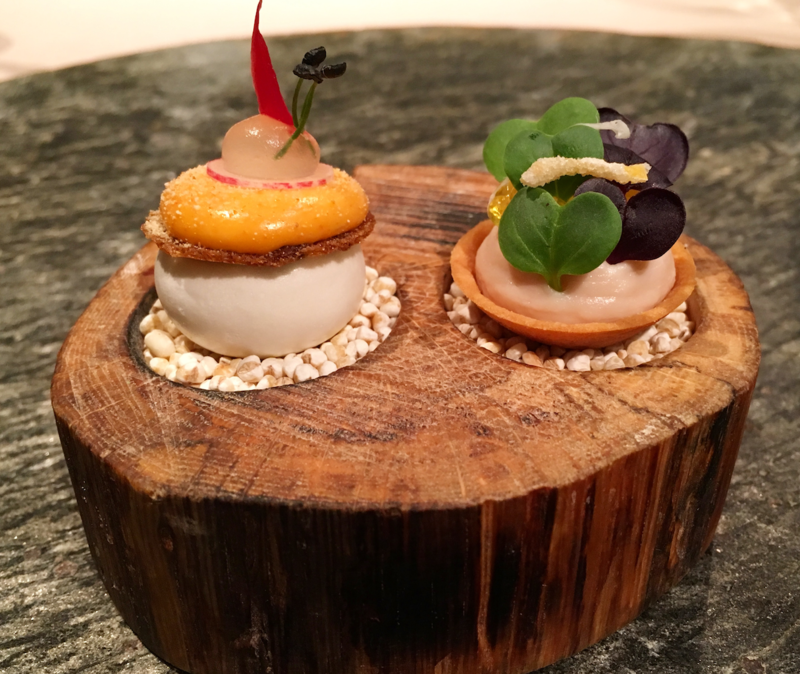 When Jan Hartwig became executive chef at Atelier, the restaurant had held a Michelin star since 2011. 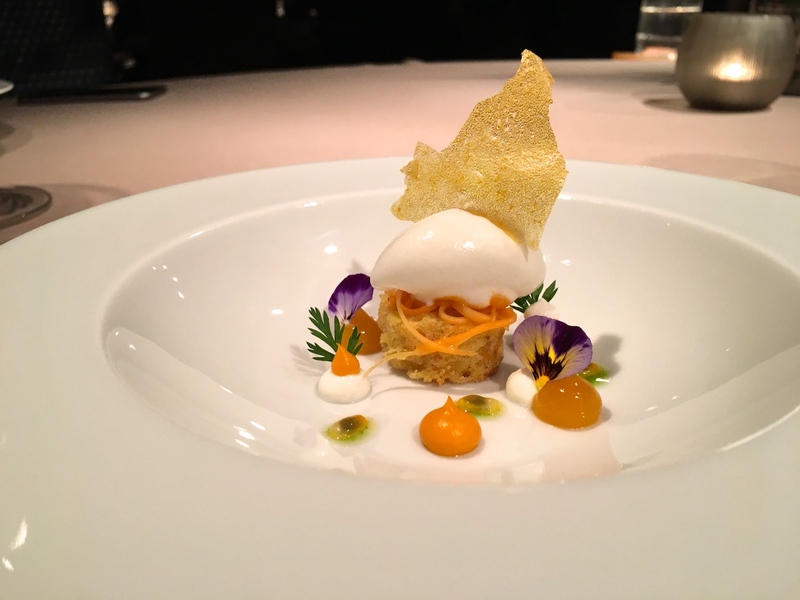 Hartwig maintained this star, and the following year, in November 2015, Atelier was awarded a second Michelin star (2016 guide). 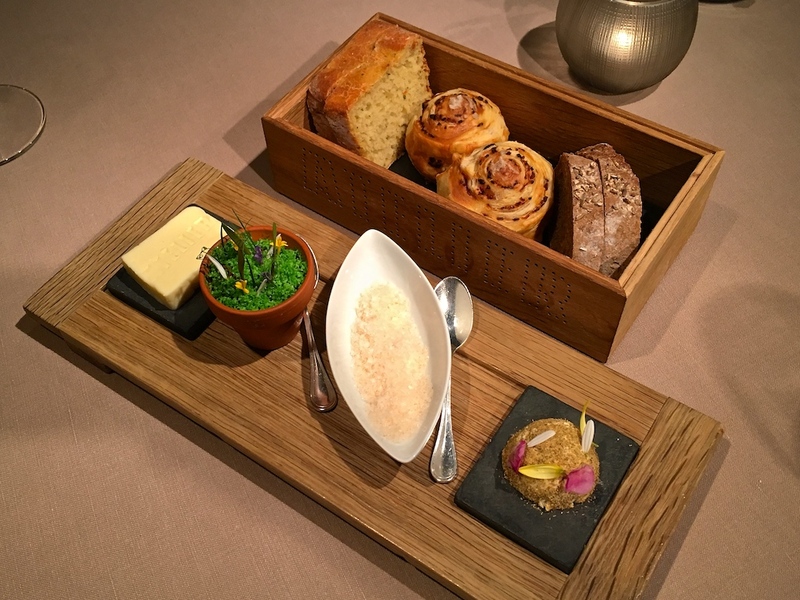 As is customary in German Michelin starred restaurants, the meal started with a number of appetisers/amuse bouches and the bread service. First to arrive was a trio of appetisers. There was a crisp brique pastry stick wrapped with speck and filled with a delicious roasted red onion crème and a fruity cumberland sauce. 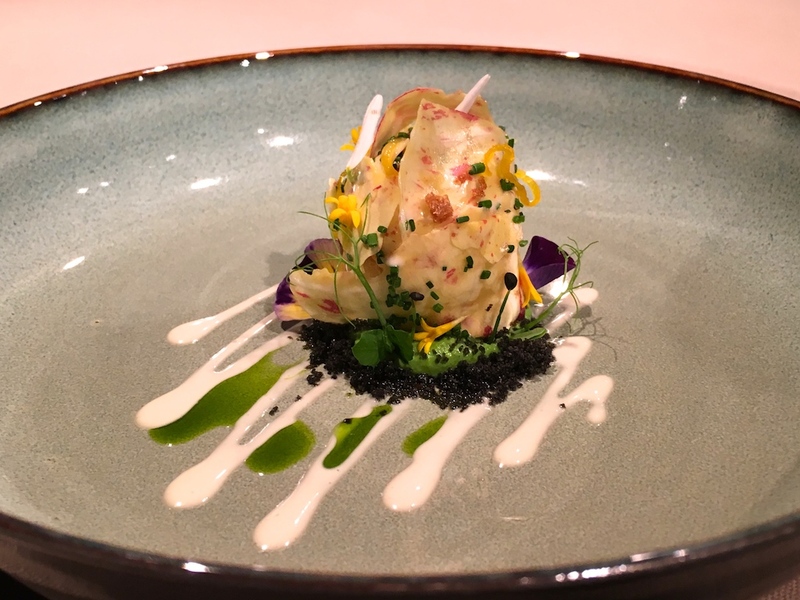 Presented on a wooden serving dish were a crisp pastry cup with smoked trout mousse and char caviar, and a lime meringue topped with a pleasantly strong Obatzda crème and lime gel. Three very precisely executed appetisers with magnificent flavours, particularly the pungent lime and Obatzda combination was superb. But even better was the next, attractively presented, amuse bouche of roasted chicken salad wrapped in chicken jelly, garnished with thin parsley and chicken skin crisps, and accompanied by dots of citrus gel, parsley puree, and sour cream ice cream placed on top of some "Malzbrot" croutons. The dish was finished at the table with a spoonful of slightly thickened potato bouillon enriched with parsley oil. 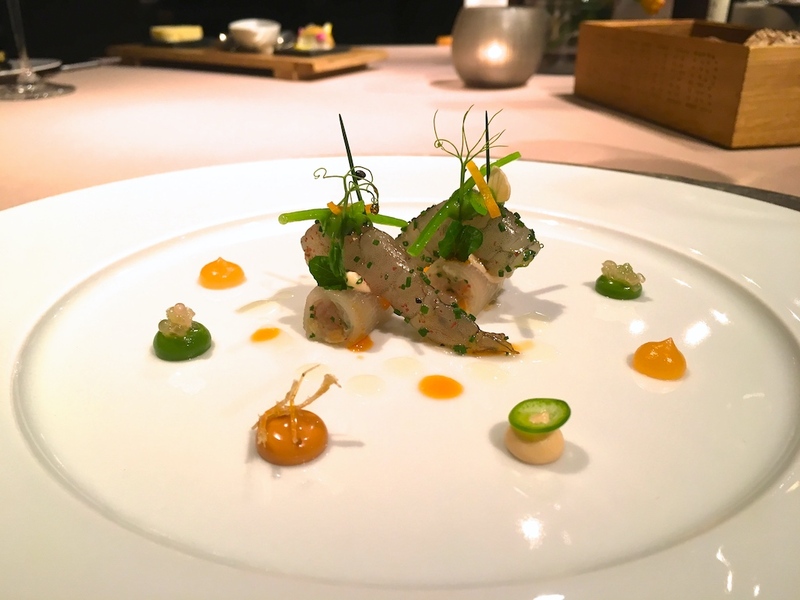 An intricate amuse bouche with precise seasoning and refined flavours, striking a wonderful balance between freshness, lightness, and intensity. Arriving around the same time was a truly outstanding bread service consisting of three types of homebaked bread (potato, onion & speck, and rye), served with local unsalted butter from the Tegernsee area, whipped and smoked butter, and an incredibly delicious "Aufstrich" (spread), beautifully presented in a little flower pot. The bright green spread was made of swede puree mixed with kale puree and was topped with frozen chive butter and garnished with crisp bacon bits. Altogether an absolute feast and it was really hard not to finish the lot. 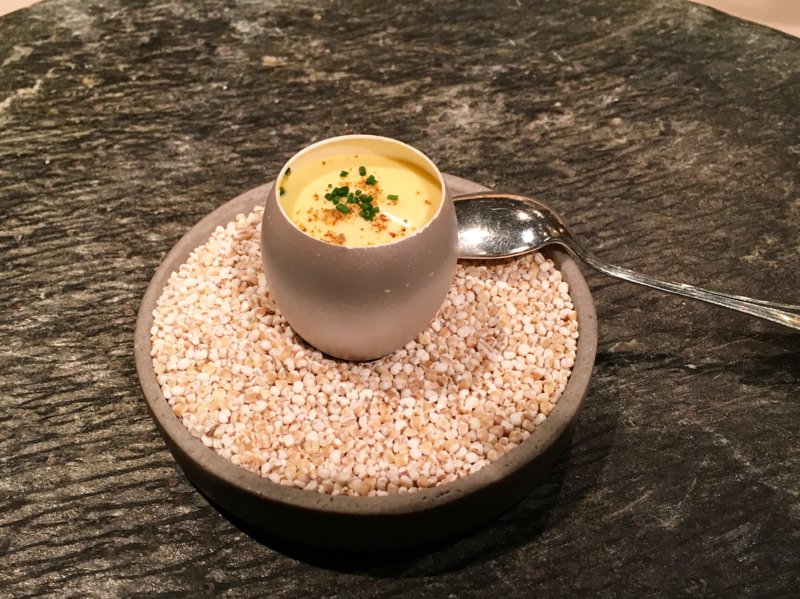 There was one final amuse bouche before the start of the tasting menu: a silver-coloured egg with, at the bottom, some diced potatoes coated with a creamy herb sauce, followed by a fried quail's egg plus an extra yolk, some crisp Malzbrot croutons and finally a gorgeous mustard Hollandaise. A delightful dish with lovely hints of tarragon from the herb sauce, and the unctuous flavours and textures were offset perfectly by the Hollandaise, which had good strong (German) mustard flavours. Time for the first course: two marinated Bavarian prawns, each served on top of a radish and hamachi (yellowtail) tartare roll, and served with dots of cocktail sauce, almond puree, guacamole puree, and grapefruit gel. Exquisite saltwater prawns, farmed (aquaculture) locally in Erding (some 26 miles from Munich), that had a lovely delicate sweetness to them. The marinating (in vinegar, lime and yuzu juice) had slightly firmed up the flesh and had lent a subtle taste to the prawns. Excellent hamachi tartare too, which was mixed with some very finely chopped almonds, the latter providing a nice little crunch. The accompaniments worked beautifully, the mildly piquant guacamole adding a silky creaminess, the almond complementing both the prawn and tartare, and the sweet acidity of the grapefruit gel added zing and lifted all the flavours. Second course was an exuberant pairing of Gillardeau oyster, Nashi pear, and Comté cheese. In the middle of the plate was a gently poached, plump and briny oyster with a Vin Jaune sauce beautifully flavoured with Comté cheese. On top of the oyster was a slice of pear, kombu and crackling and hidden underneath the oyster was some finely chopped celery, which added crunch and lightness. Surrounding this already brilliant flavour combination were the same ingredients but in a different form, bringing additional flavour and texture. 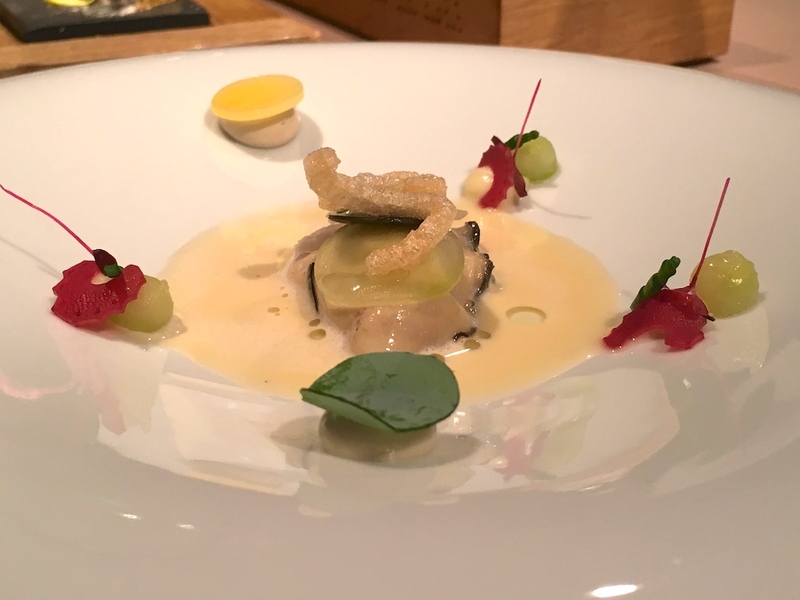 There was an oyster crème garnished with a thin disc of Comté cheese and Comté cheese crème accompanied by little pickled cucumber balls and a thin slice of celery marinated with shiso purple. A perfectly conceived and executed dish, the combination in the middle elegantly rich on its own, but wonderfully intensified by the surrounding ingredients, creating a dynamic flavour experience and a great expression of the ingredients. Equally superb was painstakingly cooked John Dory with a delicious and crunchy topping of mirepoix mixed with broccoli and pine nuts, and complemented by a glorious Sauerkraut nage mildly seasoned with speck, garnished with green "Backerbsen" (crisp batter pearls made with parsley). 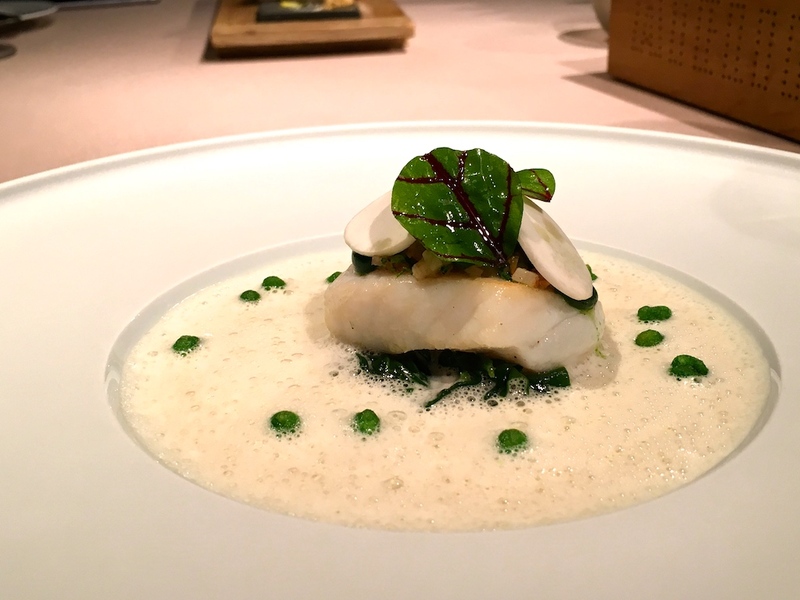 The John Dory was served on top of some wilted spinach and a concentrated mushroom crème. An outstanding dish with astonishingly good and balanced flavours, and the Backerbsen were a lovely, original and creative touch. Highlight was the pleasantly complex sauerkraut nage, rich and indulgent but with just the right acidity level, so it wouldn't overwhelm the other tastes. 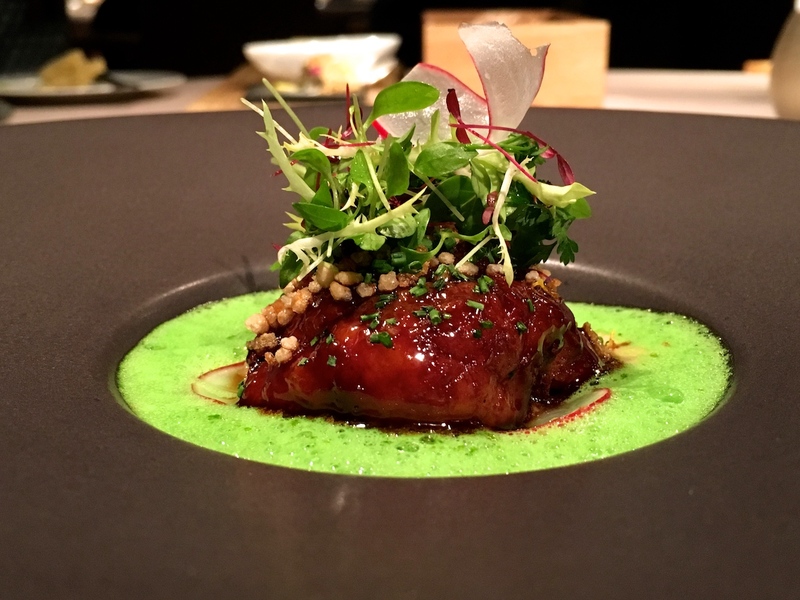 On to the fourth course, a visually dramatic plate with a spectacularly glistening veal sweetbread in the middle, surrounded by a bright green and foamy chive sauce, that had wonderfully elegant onion notes. 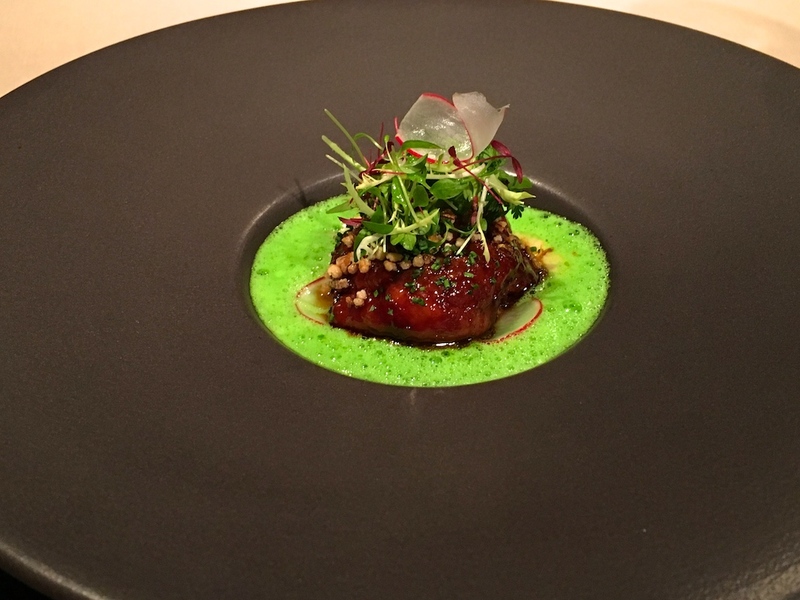 The sweetbread was pan-fried/butter-basted and then lacquered with a sticky and rich veal demi-glace sauce, and garnished with some crisp pearl barley and with some salad leaves. Hidden in the chive sauce were little cubes of tender veal's head and pieces of chopped gherkin, and the sauce was also partly covering a sublime beurre noisette emulsion. A dazzling dish with great ingredients, collectively packing a mighty rich punch, but balanced by the clever use of gherkins. Pleasing interplay of textures too: there's the moist and pillowy sweetbread with a firm but juicy bite, the light but luxurious chive sauce, the smooth beurre noisette emulsion, crunch from the pearl barley, and finally an unexpected little bite from the calf's head and gherkin. Beautiful cooking on all levels. 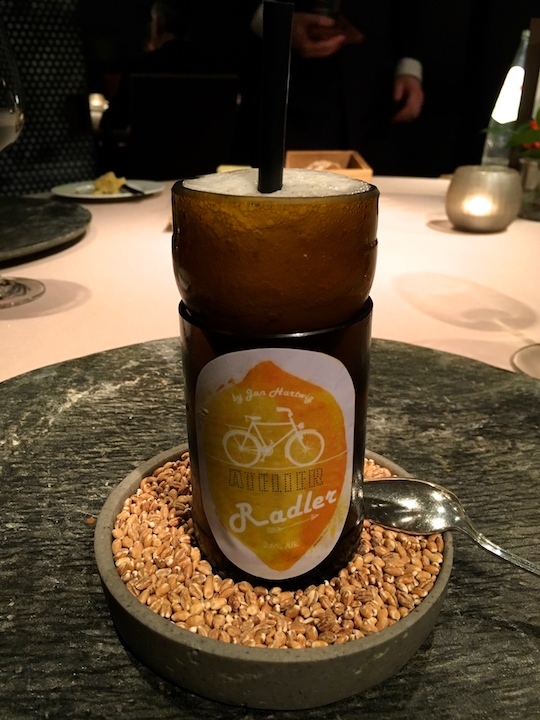 After this delightful ferocity of flavours and textures it was time to cleanse the palate before the main course.Yuzu, ginger and vanilla granita, topped with local beer (Giesinger), and playfully served in Atelier's own "Radler" bottle (Radler is German for "cyclist"). Main course was skillfully cooked, full-flavoured Challans duck, complemented by a well-reduced duck jus beautifully flavoured with orange, ginger and Japanese Sansho pepper. First you taste the essence of duck and then you get fantastic spiced orange flavours in the finish. Also on the plate was some braised cabbage, seasoned with duck Schmalz and warm spices, including a hint of 5-spice, red onion rings filled with a delicious green curry emulsion, and yellow curry cashew nuts. 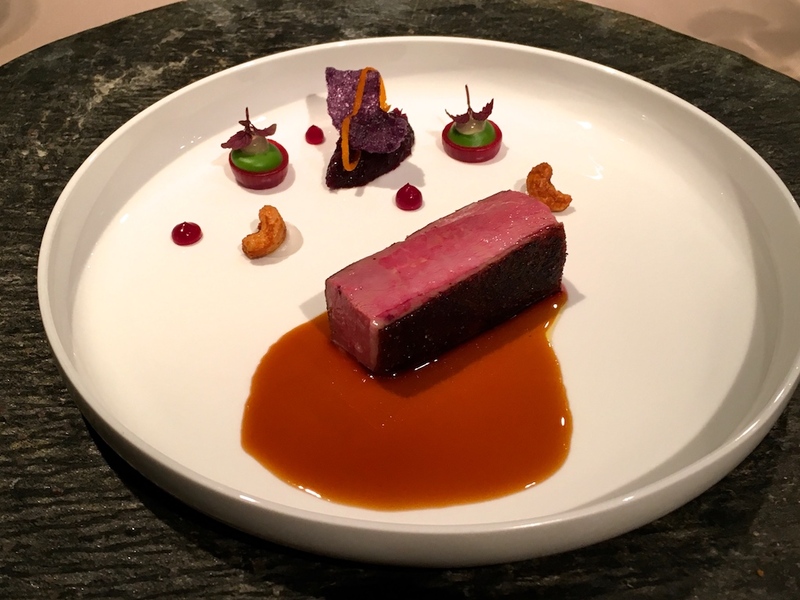 A sensational dish with masterfully incorporated Asian flavours, especially the red cabbage - you'd think it was braised in liquified Peking duck. Powerful and distinct flavours but served in the most refined fashion. The meal continued with Gaperon cheese from the French Auvergne region, a cow's milk cheese seasoned with garlic and cracked black pepper. In the middle of the plate was a carefully arranged bundle of radicchio di Castelfranco leaves (speckled endive) containing a Gaperon cheese bonbon covered with soft herb-marinated tomatoes. Underneath the Gaperon were some dark and crunchy bread crumbs (seasoned with lemon pepper and dried shallots) and rocket crème, and there was also a drizzle of French dressing. An original take on the cheese-radicchio combination, the bitters of the radicchio (and the rocket) matching the Gaperon wonderfully. Next we were served a pre-dessert of carrot cake with some Calpico ice cream perched on top, and served with carrot puree, passion fruit seeds and gel, and calpico crème. An original flavour combination and an attractive balance between sweetness, sourness, and creaminess. 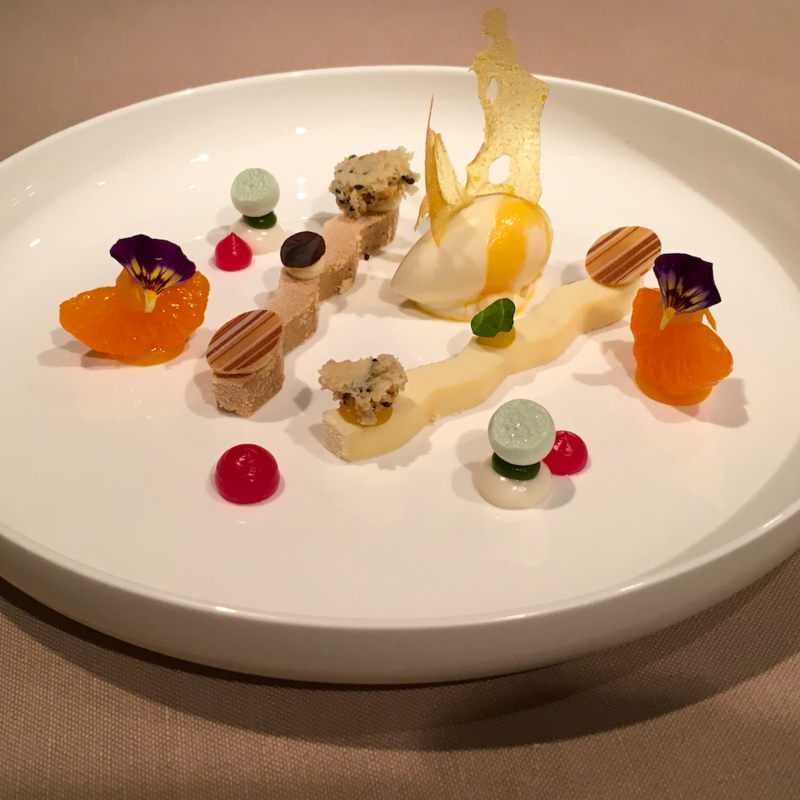 Dessert was an intricate assembly of various preparations of white chocolate (Original Beans Edelweiss) and clementines. There were two smooth and luxurious white chocolate crèmes, one seasoned with clementine and one caramelised and speckled with sesame seeds, and both garnished with thin chocolate discs, shiso leaves, and crunchy sesame biscuit pieces. Carefully arranged between/around the chocolate crèmes was an exquisite rice and clementine ice cream, red shiso gel, clementine gel, as well as mini shiso meringues and marinated clementine segments. White chocolate often has quite profound vanilla notes, but Edelweiss is a vanilla-free white chocolate. This made for a cleaner and rounder flavour experience, with the sesame seeds, used with restraint and care here, adding a nice savoury complexity. Great balance of flavours too, the clementine providing just the right touch of sweet sourness to counterbalance the richness of the chocolate. 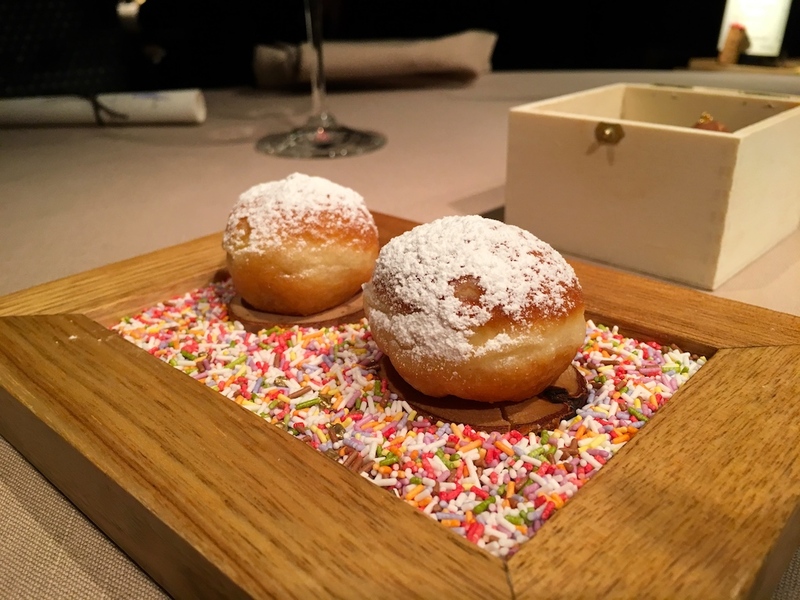 There were a number of sweets to finish the meal, but by this time I was fit to burst, so I only tried these delicious "Krapfen" (German doughnuts) filled with egg liqueur and one cherry chocolate. If you ask people what they associate Munich with, the answer is likely to be beer (Oktoberfest), football (Bayern München), cars (BMW) or a combination of the three. The gastronomic image of Munich is determined more by the Leberkäs and the manifold sausages on the Viktualienmarkt than by haute cuisine. Yet it was Munich, where Michelin first awarded a German restaurant three stars, almost forty years ago in 1979. Aubergine (Eckart Witzigmann) was the third three-star restaurant outside France at the time, and in 1981 Tantris in Munich (Heinz Winkler) became the fourth. In the 2017 Michelin guide, Germany has 10 three-star restaurants and 39 restaurants with two stars, of which no fewer than five are located in Munich. 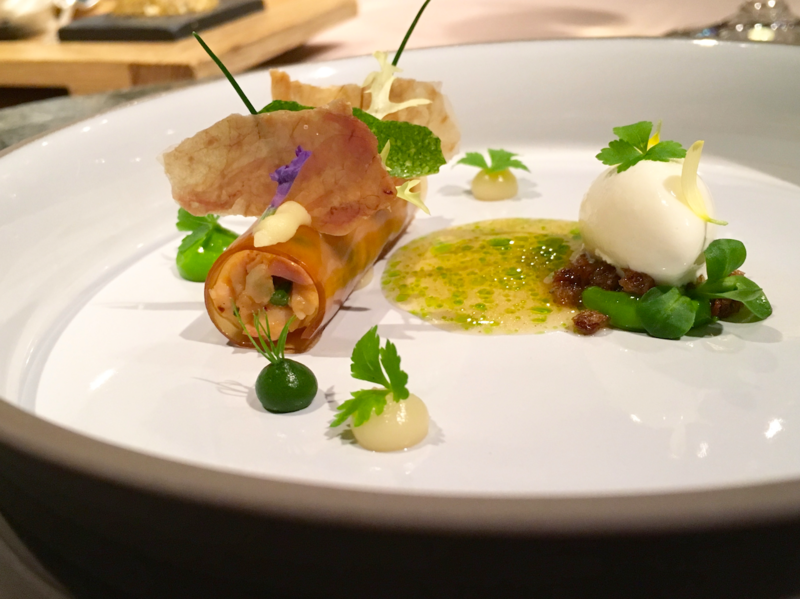 Among these five two-starred chefs, Jan Hartwig is one of the rising stars, building on almost a decade of experience gained in kitchens run by the "third generation" of German three star chefs. Having a good pedigree sets you up in the world of gastronomy, but it does not guarantee success. Chefs may have learned their trade in great kitchens, but whether they reach the top in their own right, depends on their personal commitment, creativity and skill. With Jan Hartwig, these are dancing off the plate. At Atelier he has developed a clear and precise style of cooking of his own, which excels at playing tradition against innovation and is an authentic expression of place. On his plates he consistently delivers what I consider the four fundamentals of a great dish: intensity, definition, complexity and harmony. Hartwig's beautifully presented food displays wonderful focus and tension and it holds your attention during the entire meal. 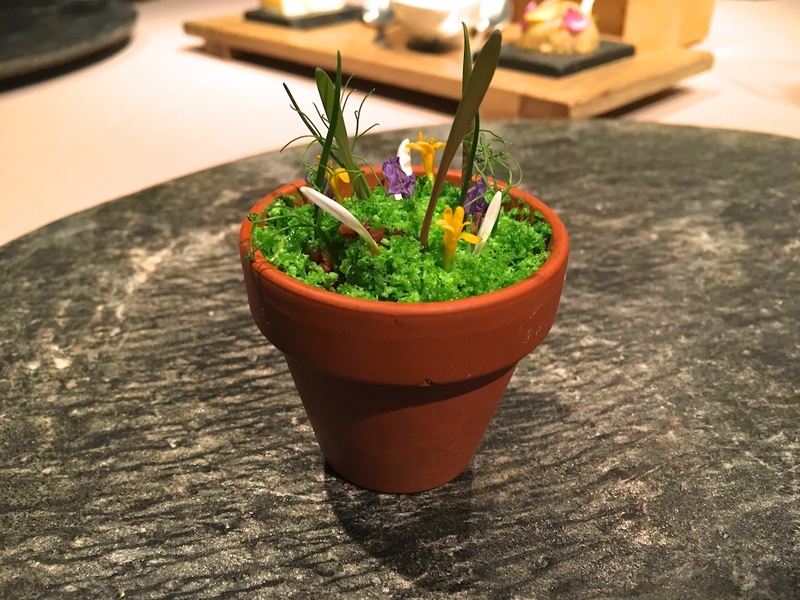 This is German gastronomy at the highest level. Since the departure of Juan Amador to Vienna, the German three-star Mannschaft is one player short. As far as I am concerned, Jan Hartwig is ready to be selected for the team.